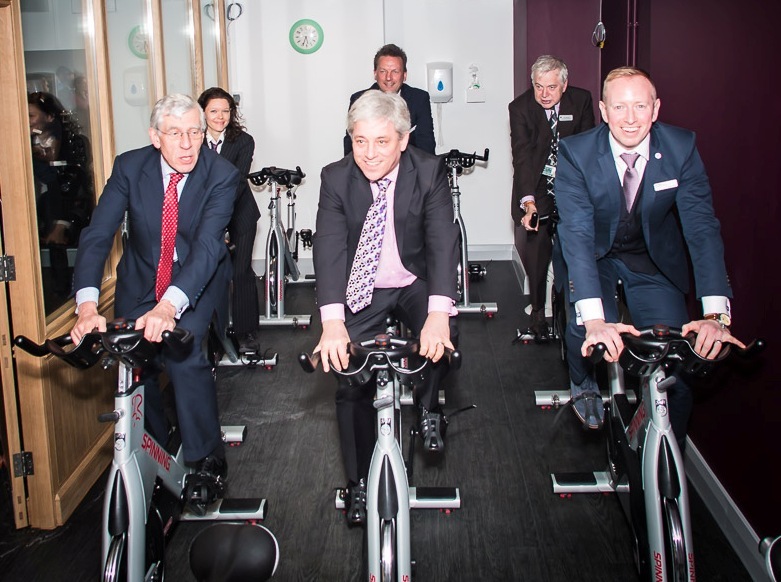 On Wednesday 28th January, the Westminster Gym in the Houses of Parliament, was re-opened after re-furbishment by Mr Speaker, the Right Honourable John Bercow MP at an event attended by many key Parliamentary figures and regular gym goers including former Cabinet Minister, Jack Straw. There has been a gym in the Houses of Parliament for many years and, since 1999, it has been managed by the Covent Garden based charity, Jubilee Hall Trust (JHT) who have worked closely with the Occupational Health Team to promote the wellbeing of the Parliamentary community. JHT Operations Director, Jon Giles, thanked the many contributors to the refurbishment works, as well as the patient members and hard-working staff and then handed over to Mr Speaker who cut the ribbon to the gym and to the new cycling studio named after him. ‘I have been an active member of the Westminster Gym for twenty years. Its an important facility for me (it was one of the key means by which I kept sane when I was a senior Cabinet Minister). It is self-evidently important for the Commons as a whole, and to my certain knowledge has contributed to the improvement in the occupational health of Members and their staff which has occurred over the 35 years I have been a Member of the House.